Harvard Medical School professor George M. Church discussed the possibilities and potential dangers of genetic engineering on Wednesday. 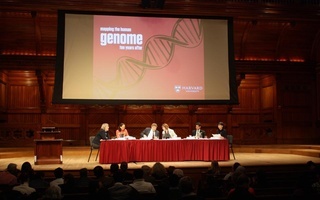 The lecture event, presented by the Harvard Museum of Natural History, covered a range of topics, including potential gains for genetic information and technologies and considerations of ethics and efficacy. Advances in the portability and affordability of genome testing, for instance, could lead to a sort of “handheld DNA sequencing device” that could dramatically impact diagnostics and field studies. Moreover, Church said, “if you have an inexpensive way of [sequencing genomes] you can really start testing a lot of ideas about cause and effect,” with the potential to identify rare protective gene variants that could alleviate or eliminate some diseases. “Your genetics is not your destiny,” Church said. Church also discussed the possibility of de-extinction, bringing back species like the woolly mammoth. He predicted that the de-extinction process would largely depend on both ecological and economic considerations, in which species are judged both on their viability in modern ecosystems and their utility. He highlighted the woolly mammoth as an example of such a “keystone” species that could dramatically and positively impact the global ecosystem, citing his 2013 Scientific American article which outlined how mammoths could contribute to the reversal of global warming by keeping the tundra frozen. “Letting the tundra melt,” Church said, “is the equivalent to burning all of the forests in all of the world and their roots two and a half times over.” Bringing back the woolly mammoth could be one important step toward preventing this catastrophic release of carbon, according to Church. Church also briefly touched on human genetic enhancements, noting that changes in the modern environment and human behavior have framed the topic of altering one’s genome in terms of necessity. Church acknowledged, however, that the question of enhancements was a very “serious problem” and one that certainly calls for more discussion. “The main ethical question about [human genetic enhancements] becomes whether it’s safe and effective,” he said. Some protections, including proper education of future generations and a strong emphasis on extensive surveillance, can be extended, he said. Erez Lieberman-Aiden, a fellow at the Harvard Society of Fellows, has won the GE & Science Prize for Young Scientists for his dissertation research developing a new method of determining the three-dimensional structure of nuclear DNA. Harvard School of Public Health researchers found that a greater consumption of sugar-sweetened beverages is linked with a greater genetic susceptibility to increased risk of obesity and high body mass index. Eric S. Lander, founding director of the Broad Institute at MIT and Harvard, was one of 11 scientists awarded the inaugural Breakthrough Prize in Life Sciences Award, which recognizes scientists in the field of curing intractable disease and extending human life. While we cut everything else, let’s cut the contradiction. Before we can understand the brain, our government must use it.